1Hematology Research Center, Shiraz, Iran. 2Department of Pathology, School of Medicine, Shiraz University of Medical Sciences, Shiraz, Iran. Received: June 19, 2018; Revised: July 15, 2018; Accepted: July 17, 2018; Published online: December 17, 2018. Production of immunosuppressive enzymes such as indoleamine 2,3-dioxygenase (IDO) is one of the strategies employed by hematologic malignancies, including acute myeloid leukemia (AML), to circumvent immune surveillance. Moreover, IDO has the ability to convert CD4+CD25− conventional T cells into regulatory T cells (Tregs). In this study, we evaluated the expression of IDO in cytogenetically normal acute myeloid leukemia (CN-AML) patients and its correlation with the Treg marker, FOXP3, as well as clinical and laboratory parameters. Thirty-seven newly diagnosed CN-AML patients were enrolled in our study along with 22 healthy individuals. The expression of the IDO and FOXP3 genes was analyzed by SYBR Green real-time PCR. Both IDO and FOXP3 were highly upregulated in CN-AML patients compared to control groups (P=0.004 and P=0.031, respectively). A positive correlation was observed between IDO and FOXP3 expression among AML patients (r=0.512, P=0.001). Expression of IDO and FOXP3 showed no significant correlation with laboratory parameters such as white blood cell and platelet counts, hemoglobin levels, bone marrow blast percentage, gender, and FLT3 mutation status (P>0.05). Higher IDO expression in CN-AML patients may be associated with an increased Treg phenotype which may promote disease progression and lead to poor prognosis of CN-AML patients. Indoleamine 2,3-dioxygenase (IDO) is a heme-containing enzyme that catabolizes the degradation of the essential amino acid tryptophan to N-formyl kynurenine and subsequent catabolites such as nicotinamide adenine dinucleotide . It has been shown that both the reduction in local tryptophan concentration and the accumulation of toxic immunosuppressive tryptophan metabolites prevent T cell proliferation by promoting the arrest of T cells in the G1 phase of the cell cycle . In addition, some tryptophan-derived metabolites such as L-kynurenine block antigen-specific T cell proliferation and induce T cell apoptosis . This immunosuppressive property of the IDO enzyme is due to the high sensitivity of T cell proliferation to local decreases in tryptophan levels, which strongly inhibit T cell proliferation . IDO is expressed by hematopoietic cells, such as plasmacytoid dendritic cells and immature DC, as well as non-hematopoietic cells such as bone marrow-derived mesenchymal cells . In normal cell types, IDO expression is mainly induced by both type I (IFN-α) and type II IFNs (IFN-γ), whereas anti-inflammatory cytokines, such as TGF-β and Th2-derived cytokines like IL-4 and IL-13, have been shown to prevent IDO expression . Recently, it has been demonstrated that IDO expression by tumor cells is associated with poor prognosis in some human malignancies . Acute myeloid leukemia (AML) is the most common hematologic malignancy in adults characterized by the accumulation of the leukemic blasts in the bone marrow that interfere normal blood cell production. Despite the recognition of AML-derived antigens by the host's T cells, the established immune response in AML patients is mostly unable to prevent disease progression, indicating that the immune system of these patients is dysfunctional . One possible explanation for this is that malignancies like AML employ different immune escape mechanisms to inhibit the generation of a functional anti-tumor immune response. To date, a number of putative immune escape mechanisms have been identified in AML disease, including the aberrant expression and activation of immune checkpoint molecules, deregulation of tumor necrosis factor (TNF) superfamily and receptors, and the production of immunomodulatory enzymes such as IDO by AML cells . There are various studies showing that, like solid tumors, IDO is constitutively expressed by bone marrow and peripheral blood AML blasts while normal CD34+ hematopoietic precursor cells do not express the IDO protein, which is associated with a poor prognosis . In addition, the increased enzymatic activity of IDO has been observed in the blood of AML patients compared to controls . Interestingly, it has been shown that production of IDO by mesenchymal stem cells (MSCs) induces differentiation of CD4+CD25+FOXP3+ regulatory T cells (Tregs) and maintains their inhibitory function thus creating an immune suppressive environment associated with aggressive tumor growth . Cytogenetically normal acute myeloid leukemia (CN-AML) is a heterogeneous disease which constitutes about 50% of AML population. Although CN-AML patients have been categorized as an intermediate risk group, the clinical experiences of CN-AML patients suggests that some patients have a favorable outcome (better than intermediate), whereas others are associated with poor prognosis . In this regard, during the last 15 years, gene mutations and gene expression profiles have provided additional prognostic information . However, sufficient data are not available regarding the expression of IDO in peripheral blood leukocytes of CN-AML patients. Therefore, in this study, we evaluated the expression of IDO in the peripheral blood leukocytes of CN-AML patients and its correlation with FOXP3 expression (a marker for Tregs), as well as clinical and laboratory parameters. This cross-sectional study included 37 newly diagnosed adult de novo CN-AML patients referred to our referral hospital during 2016–2017. AML disease was diagnosed by an oncologist using morphology, cytochemistry, and immunophenotyping. Clinical and laboratory data including French-American-British (FAB) AML subtypes, complete blood count, bone marrow blast percentage, and hemoglobin (Hb) levels were also collected. Twenty-two healthy individuals who had no previous history of autoimmune or human malignancies were recruited as the control group. All patients received standard induction chemotherapy, consisting of daunorubicin 45 mg/m2 on days 1 to 3 and cytarabine 100–200 mg/m2 on days 1 to 7, followed by high doses of a cytarabine-based consolidation phase (cytarabine 3 gm/m2 every 12 hours for 3 days, repeated for 2 to 3 cycles). This study was approved by the Ethics Committee of Shiraz University of Medical Sciences and written informed consent was obtained from all patients. All the procedures performed involving human participants were carried out in accordance with the ethical standards of the institutional and/or national research committee and with the 1964 Helsinki Declaration and its later amendments or comparable ethical standards. Karyotypes were analyzed by standard G-banding technique . Chromosomal abnormalities were tested by reverse transcriptase polymerase chain reaction (RT-PCR). Patients with no chromosomal abnormalities were characterized as cytogenetically normal AML (CN-AML) patients. Five-milliliter peripheral blood samples were collected in ethylenediaminetetraacetic acid (EDTA)-containing tubes from each patient at the time of diagnosis, prior to chemotherapy, and also from healthy controls. The peripheral blood mononuclear cells (PBMCs) were isolated from each individual using Ficoll-hypaque density gradient centrifugation. Total RNA was extracted using Trizol reagent (Invitrogen). After evaluating the quantity of the extracted RNA by Nanodrop (Thermo Fisher Scientific, USA), total RNA was converted into cDNA using a Prime Script RT Reagent Kit (Takara, Japan) according to the manufacturer's instruction in a T100 thermocycler (Bio-Rad Laboratories, USA). For the quantitative analysis of IDO and FOXP3 mRNA expression, SYBR Green real-time PCR was performed using SYBR Premix Ex Taq II (Tli RNaseH Plus, Takara, Japan) and designed primers specific for each mRNA in an iQ5 thermocycler (Bio-Rad Laboratories, USA). The levels of IDO and FOXP3 mRNA were normalized to those of GAPDH mRNA as the internal control. The primer sequences of IDO, FOXP3, and GAPDH are summarized in Table 1. Melt curve analysis was performed for all genes to confirm the specificity of reaction at the end of the program. The R2 values for the standard curve were between 0.98–0.99 for IDO, FOXP3, and GAPDH, with smooth amplification curves indicating the high sensitivity and specificity of the amplification, respectively. The changes in the relative levels of IDO and FOXP3 mRNA were calculated using the [2-ΔΔCt] method, where ΔΔCt=[ΔCt (patients)−ΔCt (controls)] and ΔCt=[Ct (sample)−Ct (housekeeping gene)]. All reactions were performed in at least duplicate wells. Data were analyzed by SPSS software, version 18. The mean expression of IDO and FOXP3 was compared between patients and the controls using the Student's t-test. 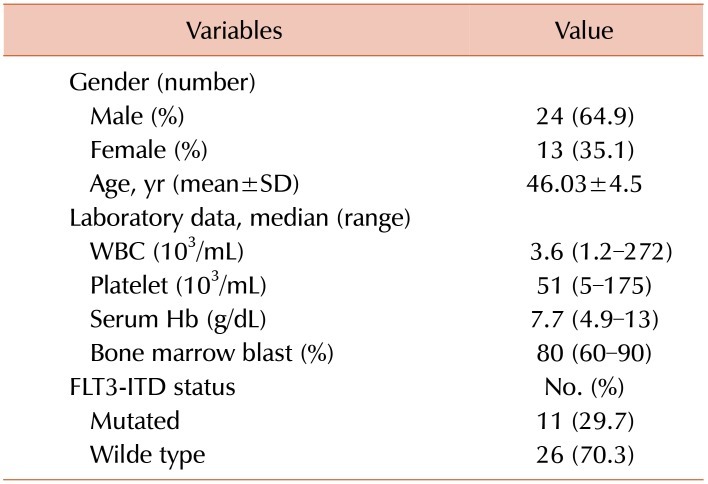 The association between the mean expression of both IDO and FOXP3 and laboratory data, including WBC, platelet count, Hb levels, and bone marrow blast percentages, was analyzed using the Pearson correlation test. P-values lower than 0.05 (P<0.05) were considered significant. From 37 newly diagnosed CN-AML patients, 24 (64.9%) were male and 13 (35.1%) were female. The mean age of patients was 46.03±4.5, with a range of 20–80 years. Among all AML patients, 11 (29.7%) had an FLT3 mutation, FLT3-ITD. Details of demographic and laboratory characteristics of the patients are shown in Table 2. The mean ΔCt value of IDO and FOXP3 was measured and compared between patients and the control group. Analysis of our results showed that the expression of IDO was significantly increased in AML patients compared to the healthy controls (9.76±2.15 vs. 11.03±1.09, P=0.004). Moreover, FOXP3 was remarkably upregulated in AML patients compared to the control group (9.81±2.28 vs. 11.18±2.27, P=0.031). There was a positive correlation between IDO and FOXP3 expression in AML patients (r=0.512, P=0.001). Furthermore, the expression of IDO and FOXP3 showed no significant correlation with the laboratory parameters WBC and platelet counts, Hb levels, or bone marrow blast percentages (P>0.05). The mean percentage of blasts in the peripheral blood of patients was about 70% (range, 2–100%). There was no correlation between the mean expression of IDO and FOXP3 and the blast percentages in the peripheral blood of the patients. The expression of IDO and FOXP3 was not significantly different between the male and female patients (P>0.05). In addition, the expression of IDO, as well as FOXP3, was not significantly different between patients with and without the FLT3 mutation (P>0.05). It has been demonstrated that defective anti-leukemic immune responses may be responsible for the inability of the immune system to control or eradicate leukemic cells in AML patients . Consistent with this, despite recognition of the antigen derived from AML cells by the T cells, the host immune system is often unable to eradicate established leukemia cells. This is due to the fact that AML employs a variety of different immune evasion mechanisms to prevent the generation of an effective anti-leukemic immune response . One of the most important putative immune escape mechanisms being exploited in AML is the production of immunosuppressive enzymes, including the IDO enzyme. In the current study, we evaluated the expression of IDO in the peripheral blood leukocytes of CN-AML patients and its correlation with FOXP3 expression (as a marker for Tregs) as well as clinical and laboratory parameters. Our results revealed that both IDO and FOXP3 mRNA were highly upregulated in AML patients. In addition, a positive correlation was observed between IDO and FOXP3 expression, indicating that elevated IDO expression may be associated with the increased Treg phenotype. IDO is a heme-containing enzyme that catabolizes the degradation of the essential amino acid tryptophan into toxic metabolites. The immunomodulatory effect of the IDO is attributed to its capacity to reduce local tryptophan concentration and promote the accumulation of toxic metabolites, both events being implicated with preventing T cell proliferation, which is highly sensitive to environmental levels of tryptophan . Dysregulated expression of IDO has also been previously reported in AML patients in various studies and is associated with a poor prognosis. Curti et al. showed that IDO is aberrantly expressed in the bone marrow samples of AML patients and proposed that its expression was constitutive and may occur as part of the transformation process since normal CD34+ hematopoietic precursor cells did not express the IDO protein. In separate studies by Fukuno et al. , Chamuleau et al. and Folgiero et al. , it was found that expression of IDO in bone marrow leukemic blasts is accompanied with an unfavorable prognosis in AML patients. The enzymatic activity of IDO has been shown to be enhanced in the blood of AML patients compared to the controls . In a study by El Kholy et al. , a positive correlation between the expression of IDO and its enzymatic activity was observed in the PBMC of AML patients. Additionally, IDO expression has been correlated with an increased Treg frequency in AML patients. In their study, Curti et al. identified an increased frequency of Treg in leukemia patients whose AML cells expressed IDO. They found that IDO-expressing AML cells were able to convert conventional CD4+CD25− T cells into CD4+CD25+ Treg cells, possibly by inducing FOXP3 expression, which was completely abrogated in vitro by IDO inhibition through 1-MT, a competitive inhibitor of IDO . In line with these findings, in another study by Curti et al. , IDO-expressing leukemic dendritic cells were shown to impair a leukemia-specific immune response, potentially by promoting the development of regulatory T cells. Therefore, the direct inhibition of T cell proliferation and the induction of the Treg phenotype are both responsible for the immune escape mechanism exploited by AML for IDO production in AML patients . Interestingly, Wang et al. showed that IDO stimulates the polarization of macrophages toward M2-type rather than M1-type macrophages, which support the immunosuppressive microenvironment in leukemia patients, promoting tumor progression and resulting in a poor prognosis. Our study is in agreement with previous reports that the expression of IDO and FOXP3, a marker for Treg, was increased in the peripheral mononuclear cells of AML patients. However, the source of the cells in which IDO expression was examined was different between our study and some of the previous studies. Regarding these results, it is possible that peripheral blood IDO-producing blasts as well as mononuclear cells such as DCs both contribute to increased IDO expression in CN-AML patients . Recently, novel IDO inhibitors, including INCB024360 (Incyte Corporation) and Indoximod (NLG2101) have been developed and appear to be highly active in pre-clinical cancer models . Several ongoing early-phase clinical trial studies are currently evaluating the efficacy of these emerging therapeutic drugs in solid tumors and in myelodysplastic syndrome (MDS), a disease that often develops into AML . Accordingly, the inhibition of IDO may be a promising approach to overcome the immune escape mechanisms associated with AML disease. In this regard, it is possible that CN-AML patients with high IDO expression may benefit from treatment with IDO inhibitors in addition to traditional chemotherapy treatment. Since the data of some patients was incomplete and because we do not have access to their clinical data, it was not easy for us to follow the disease clinical outcome of these patients or to define the prognostic significance of such changes in the IDO/FOXP3 expression in the clinical outcome of our patients, in terms of disease progression or patient survival. This limitation could be overcome by studying a larger population with patients who have accessible and complete data. This may be useful to gain a better understanding of the prognostic significance of IDO and the management of the clinical outcomes of CN-AML patients. In addition, the evaluation of IDO and Tregs in the bone marrow of patients revealed that these were the two main sources of leukemic blasts. These results correlate with those obtained from peripheral blood samples and could be beneficial for clarifying the different aspects of immune dysregulation in CN-AML patients. Taken together, our results demonstrated that high expression of IDO in CN-AML patients, along with upregulated FOXP3 expression (which delineates the possible increased Treg phenotype), may be responsible for the poor immune response of CN-AML patients and subsequent promotion of disease progression and poor prognosis. The inhibition of IDO could be a promising approach to overcome the immune escape mechanisms in AML patients with a focus on the use of novel IDO inhibitor drugs along with traditional chemotherapy in CN-AML patients with upregulated IDO expression. The primer sequences of IDO, FOXP3, and GAPDH genes. Demographic variables and laboratory data of AML patients. Abbreviations: Hb, hemoglobin; SD, standard deviation; WBC, white blood cell. Mellor AL, Munn DH. Tryptophan catabolism and T-cell tolerance: immunosuppression by starvation?. Immunol Today 1999;20:469-473. Corm S, Berthon C, Imbenotte M, et al. Indoleamine 2,3-dioxygenase activity of acute myeloid leukemia cells can be measured from patients' sera by HPLC and is inducible by IFN-gamma. Leuk Res 2009;33:490-494. Frumento G, Rotondo R, Tonetti M, Damonte G, Benatti U, Ferrara GB. Tryptophan-derived catabolites are responsible for inhibition of T and natural killer cell proliferation induced by indoleamine 2,3-dioxygenase. J Exp Med 2002;196:459-468. Munn DH, Sharma MD, Lee JR, et al. Potential regulatory function of human dendritic cells expressing indoleamine 2,3-dioxygenase. Science 2002;297:1867-1870. Meisel R, Zibert A, Laryea M, Göbel U, Däubener W, Dilloo D. Human bone marrow stromal cells inhibit allogeneic T-cell responses by indoleamine 2,3-dioxygenase-mediated tryptophan degradation. Blood 2004;103:4619-4621. Godin-Ethier J, Pelletier S, Hanafi LA, et al. Human activated T lymphocytes modulate IDO expression in tumors through Th1/Th2 balance. J Immunol 2009;183:7752-7760. Okamoto A, Nikaido T, Ochiai K, et al. Indoleamine 2,3-dioxygenase serves as a marker of poor prognosis in gene expression profiles of serous ovarian cancer cells. Clin Cancer Res 2005;11:6030-6039. Ino K, Yoshida N, Kajiyama H, et al. Indoleamine 2,3-dioxygenase is a novel prognostic indicator for endometrial cancer. Br J Cancer 2006;95:1555-1561. Brandacher G, Perathoner A, Ladurner R, et al. Prognostic value of indoleamine 2,3-dioxygenase expression in colorectal cancer: effect on tumor-infiltrating T cells. Clin Cancer Res 2006;12:1144-1151. Teague RM, Kline J. Immune evasion in acute myeloid leukemia: current concepts and future directions. J Immunother Cancer 2013;1. Austin R, Smyth MJ, Lane SW. Harnessing the immune system in acute myeloid leukaemia. Crit Rev Oncol Hematol 2016;103:62-77. Curti A, Aluigi M, Pandolfi S, et al. Acute myeloid leukemia cells constitutively express the immunoregulatory enzyme indoleamine 2,3-dioxygenase. Leukemia 2007;21:353-355. Fukuno K, Hara T, Tsurumi H, et al. Expression of indoleamine 2,3-dioxygenase in leukemic cells indicates an unfavorable prognosis in acute myeloid leukemia patients with intermediaterisk cytogenetics. Leuk Lymphoma 2015;56:1398-1405. Chamuleau ME, van de Loosdrecht AA, Hess CJ, et al. High INDO (indoleamine 2,3-dioxygenase) mRNA level in blasts of acute myeloid leukemic patients predicts poor clinical outcome. Haematologica 2008;93:1894-1898. Munn DH, Mellor AL. Indoleamine 2,3-dioxygenase and tumor-induced tolerance. J Clin Invest 2007;117:1147-1154. Lin TL, Smith BD. Prognostically important molecular markers in cytogenetically normal acute myeloid leukemia. Am J Med Sci 2011;341:404-408. Mrózek K, Marcucci G, Paschka P, Whitman SP, Bloomfield CD. Clinical relevance of mutations and gene-expression changes in adult acute myeloid leukemia with normal cytogenetics: are we ready for a prognostically prioritized molecular classification?. Blood 2007;109:431-448. Wang M, Yang C, Zhang L, Schaar DG. Molecular mutations and their cooccurrences in cytogenetically normal acute myeloid leukemia. Stem Cells Int 2017;2017:6962379. Mitelman F. ISCN 1995: An International System for HumanCytogenomic Nomenclature (2016). Basel, Switzerland: S. Karger. Folgiero V, Goffredo BM, Filippini P, et al. Indoleamine 2,3-dioxygenase 1 (IDO1) activity in leukemia blasts correlates with poor outcome in childhood acute myeloid leukemia. Oncotarget 2014;5:2052-2064. El Kholy NM, Sallam MM, Ahmed MB, et al. Expression of indoleamine 2,3-dioxygenase in acute myeloid leukemia and the effect of its inhibition on cultured leukemia blast cells. Med Oncol 2011;28:270-278. Curti A, Pandolfi S, Valzasina B, et al. Modulation of tryptophan catabolism by human leukemic cells results in the conversion of CD25− into CD25+ T regulatory cells. Blood 2007;109:2871-2877. Curti A, Trabanelli S, Onofri C, et al. Indoleamine 2,3-dioxygenase-expressing leukemic dendritic cells impair a leukemia-specific immune response by inducing potent T regulatory cells. Haematologica 2010;95:2022-2030. Wang XF, Wang HS, Wang H, et al. The role of indoleamine 2,3-dioxygenase (IDO) in immune tolerance: focus on macrophage polarization of THP-1 cells. Cell Immunol 2014;289:42-48. Vacchelli E, Aranda F, Eggermont A, et al. Trial watch: IDO inhibitors in cancer therapy. Oncoimmunology 2014;3:e957994. Moon YW, Hajjar J, Hwu P, Naing A. Targeting the indoleamine 2,3-dioxygenase pathway in cancer. J Immunother Cancer 2015;3:51.